Prehistoric rock art, ancient Egypt, and the art of Islam. 12,000 B.C.E. - 900 C.E. 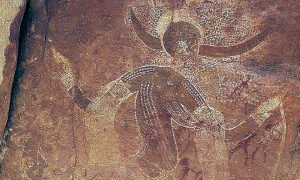 Algeria is home to some of the oldest art in human history. c. 2649 - 30 B.C.E. Though Egypt is situated in Africa, it was also a key part of the development of the ancient Mediterranean. Islamic art blossomed in Tunisia beginning in the 7th century. From prehistoric rock art to magnificent pyramids and stately mosques.